Scenic and spacious property nestled along the river surrounded by and in the midst of working rice fields. KTS Balinese Villas is genuinely one of Canggu's best-kept secrets. Set on a massive 5000 square meters and surrounded by nature, it's hard to believe your only five minutes from the city center. Neighbouring Seminyak, Legian & Kuta 15-30 minutes respectively and the ever-popular Ubud a pleasant and picturesque drive only 30-45 minutes away. 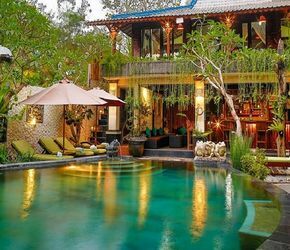 Ideal location to visit many of Bali's historical and world-famous attractions without the hustle, bustle and traffic congestion found in neighboring areas. Tanah Lot, The Largest Ricefields in Bali, Echo Beach, Old Mans and more. Plus Easy Airport Access Only 18 km's away. 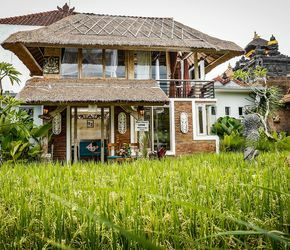 KTS- Ketak Tepi Sawah Balinese Villas oozes a traditional Balinese atmosphere. and if you are looking for Peace and Tranquillity, you will find them here. Locally owned by Lilik and Sudi Artawan who have embraced their culture and created an authentic Balinese environment for guests to immerse themselves, reminiscent of Bali in years past. Unlike many of their competitors, Liklik and Sudi's believe people visit Bali, to experience Bali, and over the years have collected many historical artifacts, from the very small to entire tradition homes, with each piece having its place in Balinese history and story to tell. 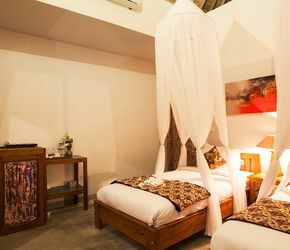 Your hosts have also embraced the understanding that their guests still appreciate all the mod cons and creature comforts of home, such as fiber optics wifi, air conditioning and hot showers to name a few, and have tastefully incorporated the new with the old so you will be well looked after. Their onsite restaurant is ahead of its time producing many western and traditional dishes from their Onsite Organic Gardens to Plate. Tradition cooking classes are available daily with freshly picked and hand-selected produce. Onsite Yoga Studio, Garden Spa with many traditional treatments, Tours and Activites desk ensure there is something some everyone. Book Direct & Save - By dealing direct, you eliminate agent fees, commissions, hidden charges, tedious 3rd-party communication platforms (&) Receive the best deals, priority upgrades, and an overall better service saving "us" both Time & Money! 100% Guaranteed & 110% Appreciated 🙏🏻 Our prices include all government taxes, fees & no last-minute charges! Lowest rates and best deals 100% guaranteed. Check-in service available 24-hours a day, every day. Fast and secure wireless connection in all areas. Private airport transfers upon arrival & departure. Private hotel transfers upon arrival & departure. Relax and enjoy your breakfast on your time. Why & How To Book Direct? Because we have made sure that dealing directly with us super easy and we will both save time and money, keep reading for more info. How do I book direct? Very easily, click here and follow the prompts if you have a promo code already, or click here and watch this 1-minute tutorial. By dealing directly with us, you eliminate all agent fees and commissions allowing us to provide you with the best deals 100% guaranteed. What if I have special status with my online agent? It is still cheaper to book directly with us because all our agent's rates and promotions are derived from our direct rate at a higher price. What if I see a cheaper price somewhere else? Other than computer glitches! Simply stated, it's just not possible. Please note, you will not encounter any last-minute hidden charges or surprises when you deal directly with us! All our rates include all taxes and fees with no more to pay. By dealing directly we bypass pointless and tedious 3rd-party communication platforms plus our online direct booking engine is fast, secure, user-friendly and responsive across all devices, great for mobile phone bookings. Can I have an early check-in, late check-out for free? Yes, Providing your room is "available" we are very flexible. Do we provide private airport transfers at any time. Yes, Refer to our "Facilities | Events | Services" page, see above. Do we provide other services & activities. Do we provide any other complimentary services. Will I get the best price and deal if I book direct. Yes, 100% Guaranteed when you book direct. Do we provide private island transfers at any time. Can I check-in or out at any time. Yes, 24-7 Our team will assist you with all your requirements. Do we have check-in/out times for booking purposes. Yes, Check-in time is 2.00 pm and Check-out time is 11.00 am.